Intensity on the power output of a solar cell. As pollution becomes an increasingly important factor in energy production, the need arises to harness other ‘clean’ energy sources. 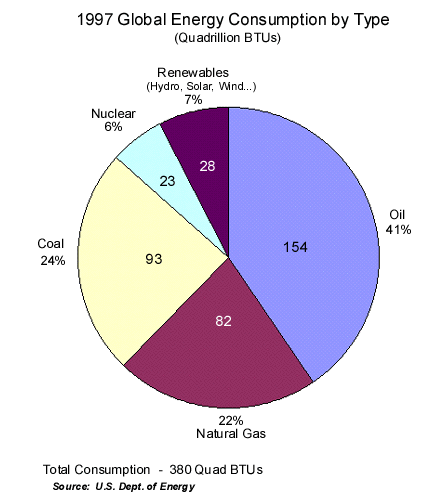 Many of these energy sources, such as wind, tidal and solar, are used now but only in small amounts. In the near future it will become even more important that we use these as the non-renewable supplies, such as oil, finally run out. 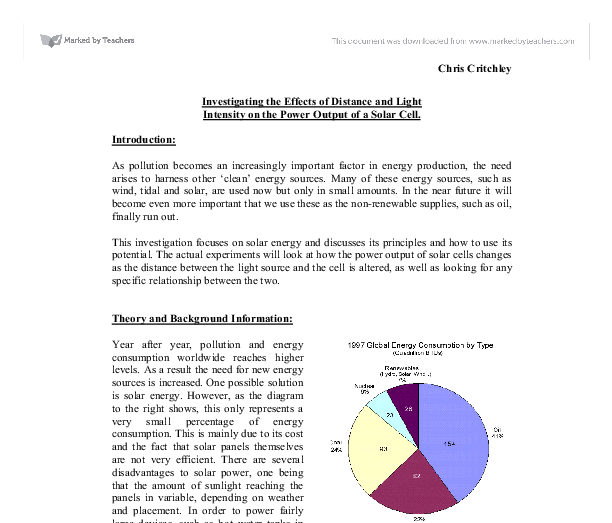 This investigation focuses on solar energy and discusses its principles and how to use its potential. The actual experiments will look at how the power output of solar cells changes as the distance between the light source and the cell is altered, as well as looking for any specific relationship between the two. Year after year, pollution and energy consumption worldwide reaches higher levels. As a result the need for new energy sources is increased. One possible solution is solar energy. However, as the diagram to the right shows, this only represents a very small percentage of energy consumption. This is mainly due to its cost and the fact that solar panels themselves are not very efficient. There are several disadvantages to solar power, one being that the amount of sunlight reaching the panels in variable, depending on weather and placement. In order to power fairly large devices, such as hot water tanks in homes, a significantly large solar panel is needed, sometimes even spanning the entire roof of a building. These large solar panels can be very expensive due to the fact that they are made up of hundreds of smaller solar cells. If more time had been available and if I hadn’t made such a radical change from the preliminary method, I would have investigated further into factors affecting the power output of a solar cell. These factors could have included wavelength of the light hitting the cell, temperature of the cell and the angle at which the light hits the cell. Another variable to investigate would have been the resistance across the cell and how it changed with the distance from the light source. This would be useful, as the variable used in this investigation, the voltage, did not change much at all. Using the resistance instead would give me an opportunity to look for other relationships. To put the experiment into a social context, this and similar investigations would help in improving the efficiency of solar cells as they would give manufacturers a better idea of which factors that they can control and which factors most affect the final power output. It would also help in determining how best to place solar panels. The most valuable investigation for this purpose would be looking at the angle at which the light hits the cell. 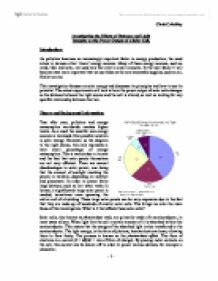 Overall this particular investigation has been successful in that it has fulfilled its goals and has shown that there is indeed a specific relationship between distance from the light source and the power output across the solar cell. the value of I with the internal resistance r and later subtracted it with the value of V in order to obtain the emf (the potential difference of the cell), this formula helped to calculate or to proof the variable of the unknown above symbols especially the emf. Set the variable resistor so that the LED receives a constant maximum voltage of 2.00volts. This will give a constant intensity of light. A set distance form the LED, a matter of millimetres, place a prepared piece of black card stood up. A very high degree of consistency can be described as having a standard deviation of less than 1. Data recording Before beginning the experiment I created tables which were efficiently constructed and arranged orderly and therefore aided the process of recording the data. In silicon there are 4 valence electrons. For Hydrogen there is 1 valence electron. So when the atoms come together as a cluster they form a lattice. In this lattice the valence electrons come together to form what we call a valence band. I then used blu tack to secure the spindle stayed in the hole; this was necessary if the movement of the float was going to rotate the spindle. At the other end of the cardboard I used sealing tape to secure a copper wire to it. It would have made it easier since the generator needed a strong magnetic field or a relatively fast torque; therefore it was hard to test it with small speeds. * Got a smoother material for the axle - since there was too much friction and it made the whole generator very inefficient. Wavelengths above those of visible light (Infrared, Microwaves etc) won't have enough energy to knock off an electron. Wavelengths shorter than those of visible light (UV, X-Rays etc) have more energy and this extra energy will just be wasted. For an electron to be knocked off, there has to be a particular "Band Gap Energy". In the second part we put the tap on slowly and held the pipe in the funnel and timed it making sure the voltmeter and ammeter are on. Experiment 5- Water Wheel Energy input= (() × 0.5) × 9.81× height (1m).